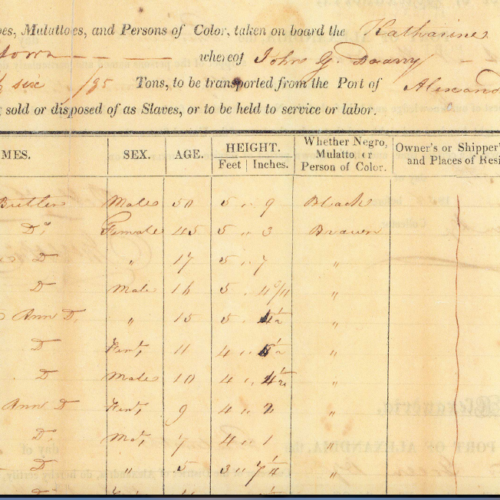 Katherine Jackson Manifest (Photo: Georgetown Slavery Archive). Shameful actions occurred in Maryland almost 200 years ago, but the pain is palpable for descendants of slaves sold in 1838 to the owners of three sugar cane plantations in Southeast Louisiana. Founded in 1789, Georgetown College – now Georgetown University – was in debt and its president, the Rev. Thomas Mulledy, S.J., decided the solution was to sell off 272 enslaved men, women, and children – 40 family groups – for about $3.3 million in today’s dollars. The abolition movement was gaining ground and they feared their human property might decrease in value. In the 17th, 18th and early 19th centuries, the Society of Jesus was one of Maryland’s largest slave owners with six plantations. The estates had been given to them by the Lords Baltimore; wealthy Catholic families deeded slaves to support their ministry. “[Georgetown] was built in the blood and the brawn and on the backs of my family,” said Mélisande Colomb. Colomb’s ancestors came to the colony from British Bardados in 1677 as indentured servants, but the women’s papers were destroyed. At that time in the colonies, all black people were necessarily slaves. Starting in the 1790s, Colomb’s family sued the Jesuits more than 10 times, trying to regain members’ freedom. The case “Mima Queen & Louisa Queen v. John Hepburn” was brought before the U.S. Supreme Court in 1810, but denied because its proof was verbal testimony, thereby “heresay.” Francis Scott Key, who wrote the lyrics for “The Star-Spangled Banner,” was the Queen family’s attorney. A retired cook, Colomb received a phone call in August 2016 from Judy Riffel, a genealogist hired by the Georgetown Memory Project, confirming the stories her grandmother told her. Colomb’s great-grandparents and their seven children had been “sold down the river” to work in the fields of sugar cane plantations owned by Dr. Jesse Batey and Henry Johnson, fifth governor of Louisiana. For Georgetown University, the convenient story had been that all the slaves had perished, which was true, but they left many descendants, now 7,000 identified individuals, but probably more than double that number. The Jesuits’ slave history was known to scholars, but most university staff and students were unaware; although, it was well documented, according to Adam Rothman, a Georgetown history professor whose study focuses on American slavery. The Articles of Agreement drafted by the Rev. Thomas Mulledy, J.S. identified 200 children by name. A Working Group on Slavery, Memory and Reconciliation, comprised of students, alums and faculty, was formed in 2015 to identify and support descendants, as well as to educate the university community. Richard Cellini, chief executive of a technology company and a Georgetown graduate, hired eight genealogists to locate the descendants, using public records, including bills of sale, Census and court records. The Georgetown Memory Project has become the largest genealogical study ever conducted in the United States. “Everybody knows about the Mayflower people, but this was more people,” Colomb said. Not all the Jesuit slaves were sold and so many connections exist between the descendants of slaves from the Maryland and Louisiana plantations. Descendants formed the GU272 Descendants Association and made recommendations to the university. “Nothing about us without us,” descendants told Georgetown’s president. In attempts at reconciliation, Georgetown has renamed two buildings for former slaves, Isaac Hawkins and Anne Marie Becraft, replacing names of the Jesuits who were responsible for the sale. The university has also granted legacy status to descendants.